He enlisted in the 22d Mass. Reg., Sept. 6th, 1861, and served until 1864; he was a brave and faithfui soldier, and had seen a great deal of fighting in his three years of service. He took part in the following battles: Bull Run, Malvern Hill, Yorktown, Fair Oaks, Chickahominy, Sharpsburg, Gains' Mills, Hanover Court House, Mcchanicsville, Harrison's Landing, Antietam, Fredricksburg, Chancellorsville, Gettysburg, Culpepper, The Wilderness, Laurel Hill,Spottsylvania, Jericho Ford, North Anna, Petersburg (where he was severely wounded), Tolopotomy Creek, and several others. William died on January 7, 1890 in Dorchester, Massachusetts, at age 46 "It is again our painful duty, to announce the quite sudden death of another trusted and faithful U. S. Letter Carrier; brave, patient, genial " Billy" Woodward, the oldest Letter Carrier at this station, who died at his home"
The cause of his death was pneumonia, and he had been sick but about a week. He was formerly a member of the G. A. R., but allowed his membership to lapse. He was also a member of Norfolk Lodge and Siloam Encampment, I. O. O. F., and the Boston Letter Carrier's Association. He had not accumulated much of this world's goods, and left a family of a widow and ten children. His desk at the post-office was draped with black, across the face of which in gold letters was his name and carrier's number. His funeral took place Friday forenoon, Jan. 10, and was attended by a vast number of people. Rev. Dr. Arthur Little of the Dorchester Second church, officiated. Superintendent Jones of Dorchester and the twenty two Letter Carriers were present; delegations from Benjamin Stone, Jr., Post 68, G. A. R., Norfolk Lodge and Siloam Encampment of Odd Fellows, and Boston Fire Department. The services were touching and beautiful. The following Resolutions of respect to the memory of William T. Woodward, were adopted by the Letter Carriers, at the Dorchester Branch Postoffice, Jan. 15. 1S90. Resolved, That while we deeply deplore the loss from our ranks of so faithful a comrade and friend, we bow submissively to the will of Him who "doeth all things well." Resolved, That, we recognize most gratefully the meritorious service he rendered the country as a private and corporal in the 22d Mass. Volunteers for three years, enlisllng when only eighteen years of age, and being severely wounded in fighting its battles. Resolved, That the public with whom he came in contact by his daily rounds as a Letter Carrier, he served with rare fidelity and unfailing courtesy, and the Government by whom he was employed, with integrity of purpose and strictest honesty in the discharge of his duties. Resolved, That we, his associates, in the Dorchester Post-office, recall with great pleasure his cheerfulness at all times, and his steadfast devotion to work, as also his loyalty of friendship to former comrades of the army. Resolved, That we deeply sympathize with his afflicted family in their loss of a kind husband and an indulgeut father, and tender them our sincere and heartfelt condolence. Unknown author, "A Familiar Figure Gone", The postal record Vol. 3 (January, 1890): p. 56. 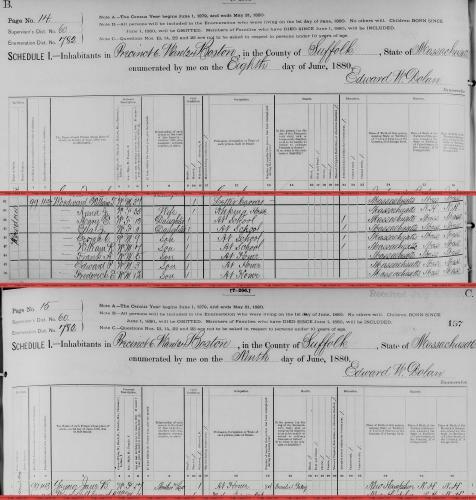 "New Hampshire, Birth Records, Early to 1900," index and images, FamilySearch (https://familysearch.org/pal:/MM9.1.1/FL5S-G6Y : accessed 09 Dec 2012), Geo E Woodward in entry for Woodward, 23 Sep 1850. Sarah Wormal was born perhaps about 1681. 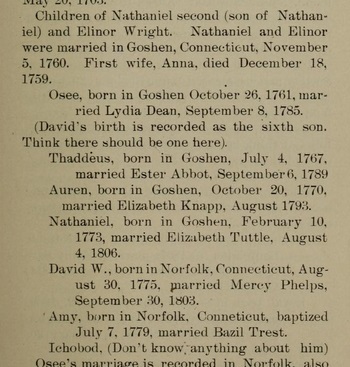 Vital records of Bridgewater, Massachusetts, to the year 1850, Boston, Massachusetts: New England Historic Genealogical Society, (1916) , Vol 2, p. 29. Vital records of Amesbury, Massachusetts to the end of the year 1849, , at https://archive.org/details/vitalrecordsofam00ames . Topsfield, Mass. : Topsfield Historical Society, (1913) , p. 249. Vital records of Amesbury, Massachusetts to the end of the year 1849, , at https://archive.org/details/vitalrecordsofam00ames . Topsfield, Mass. : Topsfield Historical Society, (1913) , p. 359. Mrs. Merriam Worthen was born perhaps about 1733. Vital records of Amesbury, Massachusetts to the end of the year 1849, , at https://archive.org/details/vitalrecordsofam00ames . Topsfield, Mass. : Topsfield Historical Society, (1913) , p. 312. "Connecticut Deaths and Burials, 1772-1934," database, FamilySearch (https://familysearch.org/ark:/61903/1:1:F721-62K : 3 December 2014), Harry S. Cahoon, ; citing , reference 52; FHL microfilm 3,332. "United States Census, 1920," database with images, FamilySearch (https://familysearch.org/pal:/MM9.3.1/TH-1942-22898-4796-41?cc=1488411 : 14 December 2015), Connecticut > New London > New London Ward 2 > ED 261 > image 4 of 48; citing NARA microfilm publication T625 (Washington, D.C.: National Archives and Records Administration, n.d.). Eleanor Wright was born perhaps about 1740. John Wright was born perhaps about 1752. [female] Wright was born perhaps about 1955. Bethany Wyatt was born perhaps about 2004. She is the daughter of Todd S. Wyatt and Sarah Catherine Prince. Todd married Sarah Catherine Prince, daughter of Billie Morris Prince Jr. and Marcia Frances Levine. Todd S. Wyatt lived at Wellford, Spartanburg County, South Carolina. He worked at Clock Family Restaurant in Duncan, S. C.